The old road had multiple roadbed alignments in many stretches of the highway throughout its history. 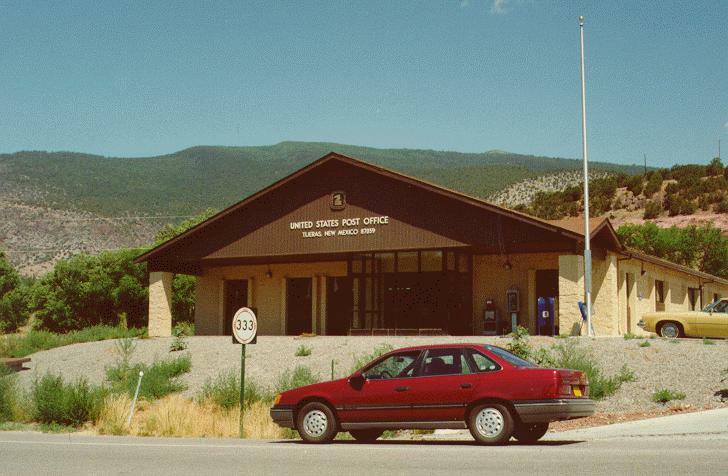 In New Mexico the two priciple alignments were the pre-1937 alignment and the post-1937 alignment. The pre-1937 alignment ran north to Santa Fe and then south through Albuquerque to Isleta before again heading west. This stretch followed the Santa Fe railroad right-of-way. The post-1937 alignment took the more direct approach, bypassing Santa Fe and going straight from Santa Rosa to Albuquerque, and from Albuquerque to Laguna. 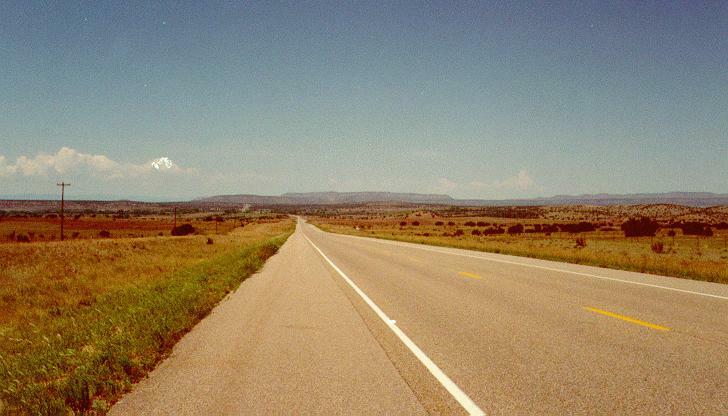 The Llano Estacado or "Staked Plain" stretches frpm Glen Rio, Texas, to Santa Rosa, New Mexico. Early travelers put stakes into the ground to find their way from place to place. The area is almost featureless making this practice necessary. 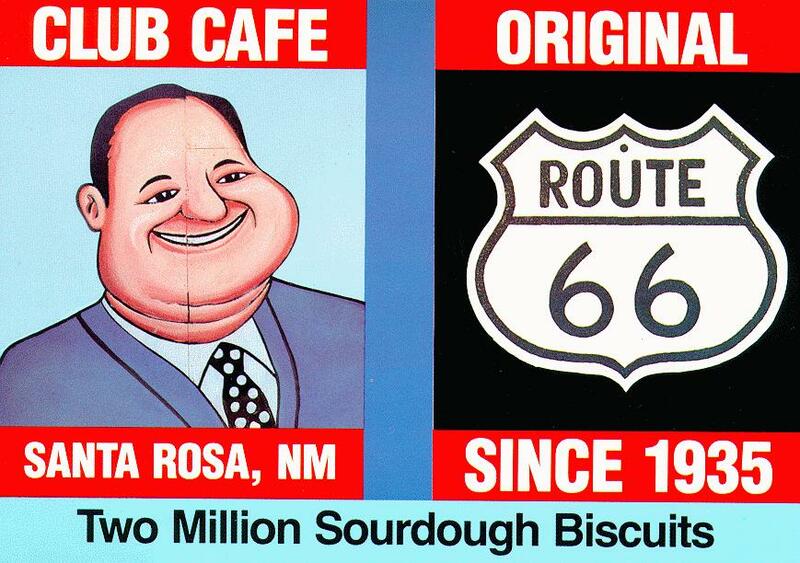 It is possible to stay on the old road from Tucumcari through Montoya, Newkirk, and Cuervo, to Santa Rosa. 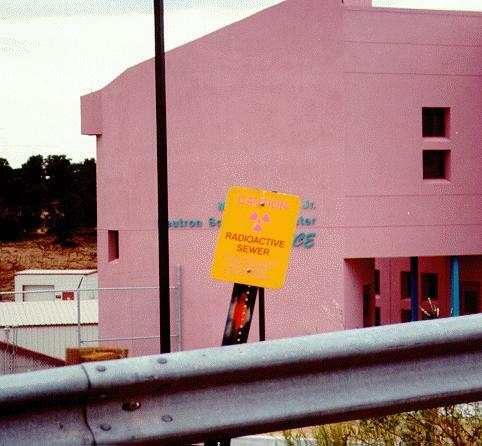 You must rejoin the Interstate at exit 311 for the drive to Tucumcari. Take exit 329 to follow the old road through Tucumcari, and through San Juan and Bard, all the way to Glen Rio, Texas. At exit 256 take US 84 north towards the town of Dilla. This is the old Route 66 roadbed. Continue north on the old road past Romeroville to I-25. At this point you can continue on the old road or take a short detour north along I-25 to the town of Las Vegas, New Mexico. This is the site of the Harvey House and the La Castenada Hotel, both of which were still standing in 1990 when I last visited. Las Vegas was a railroad town and the Santa Fe still runs through it. The Trains coming over the awesome Raton pass (about 100 miles north of here on I-25) would change engines here. The old station is still standing and Amtrak trains still stop there. The town has many old buildings still standing around the park at the center of town. Return to Romeroville and exit I-25. 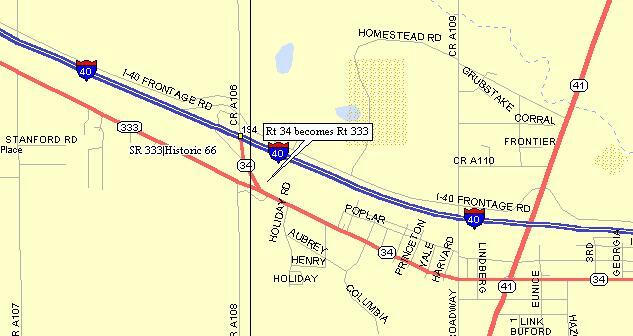 Follow the old road along the north side of I-25 all the to Glorieta where you must rejoin I-25 to get into Santa fe. 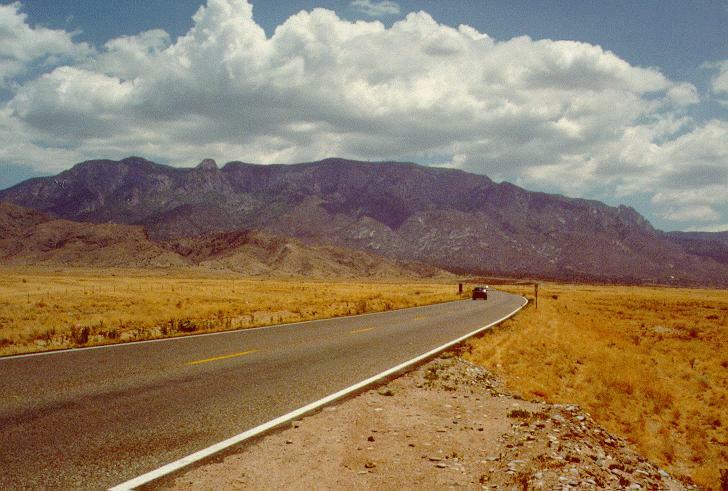 Along the way you may wish to stop at Pecos National Monument. 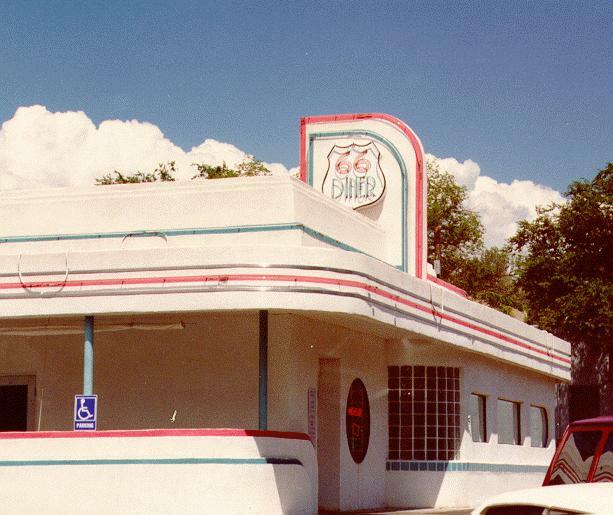 Take the Old Santa Fe/Pecos Trail exit and proceed north along what was Route 66 to the Plaza in Santa Fe. 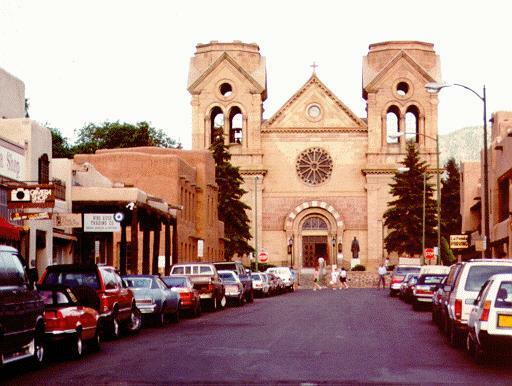 On San Franciso Avenue, south of the Plaza is St Francis of Assisi church. The best hotel is the El Dorado. It is very posh and the views from the upper floors are great. 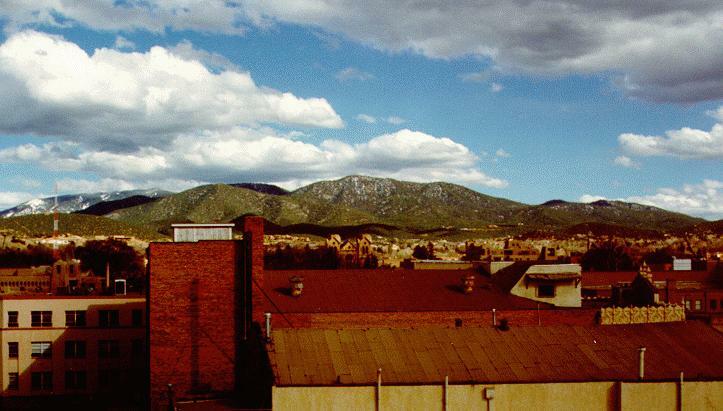 The view from room 501 is excellent allowing you to see the sun rise over the Sangre De Cristo (Blood of Christ) moutains. Walk along the streets which surround the Plaza and you will see many old buildings such as the movie theatre. 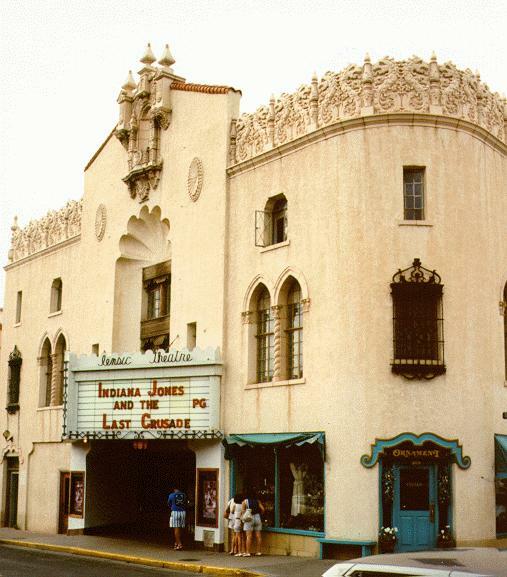 On this trip "Indiana Jones and the Last Crusade" was the hot ticket. 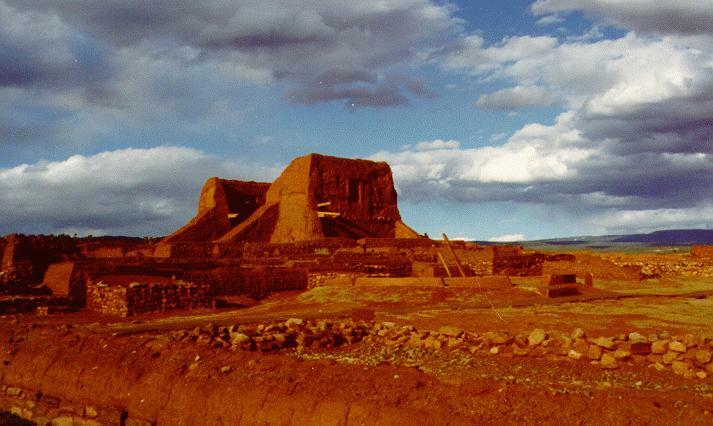 If you have the time, visit some of the pueblos north of Santa Fe, such as the one at San Il Defonso. You can purchase Native American art directly from the artists here. 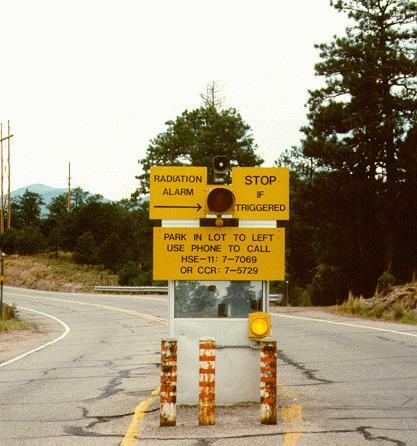 You can also pop over to Los Alamos, home of Los Alamos National Laboratory. While riding around here we found radioactive sewers. Then as we left we saw this rather startling sign at the gate. The most famous attraction in Santa Rosa is the Club Cafe. I heard somewhere that it finally closed which is too bad. So I have the photos and this postcard to remember it. The old buildings are disappearing fast along the old road. 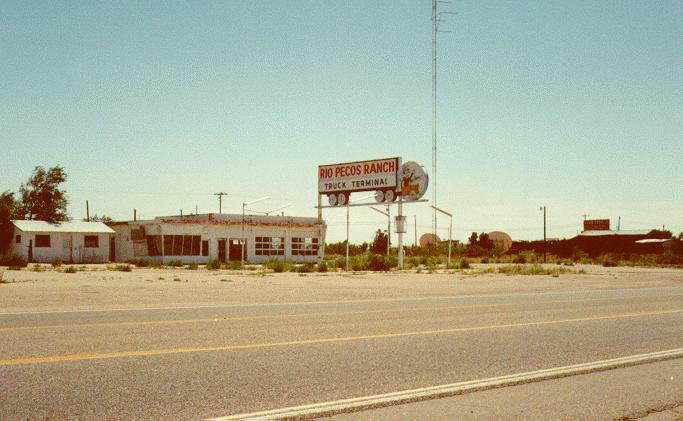 Across the road from the Club Cafe is the Rio Pecos Ranch truck terminal. 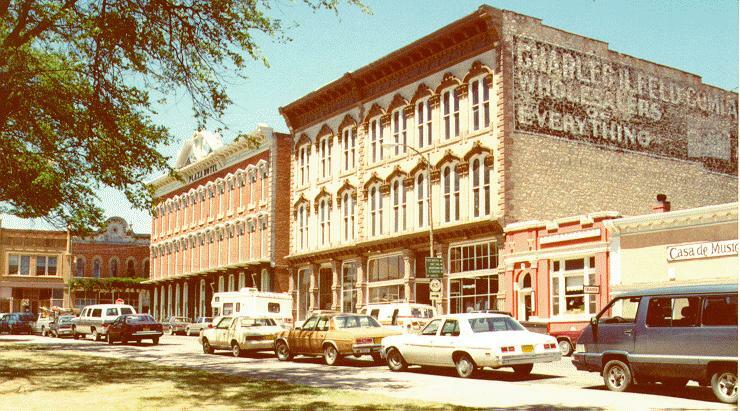 This photo was taken in 1987. Leaving Santa Rosa on the old road you can see theSandia Mountains north of Albuquerque on the horizon. You must rejoin I-40 at this point to continue to Moriarty. A little past the midway point to Moriarty you pass Clines Corners. You can exit the interstate here to get to it, but it's not worth the detour unless you insist on visiting every Route 66 relic. Take exit 197 to enter Moriarty on what's left of the old road. You will see signs marking this as New Mexico State Road 34. You will also see brown "Historic Route 66" signs. Visit the Moriarty Museum if you have time. It is a time capsule. The folks who work there can tell you stories about the old road. You have to hurry to see the old buildings because they are disappearing fast. Here is the old road as it appeared in 1987. Leaving Moriarty on the old road you see the Sandia Mountains in the distance. 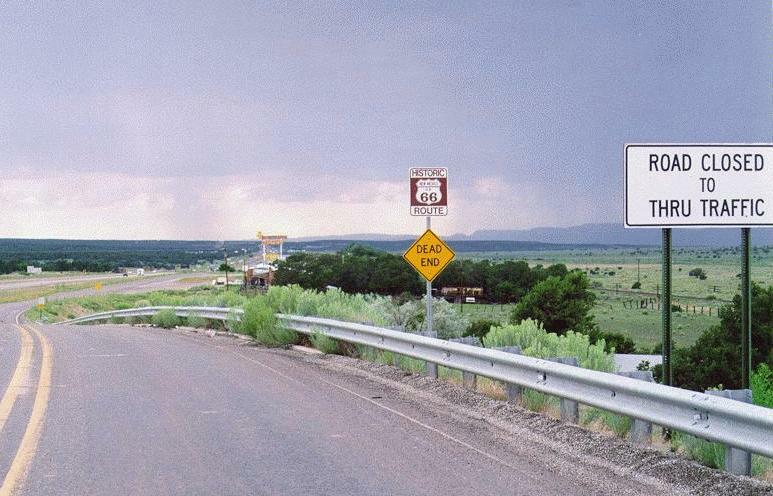 The road changes from State Road 34 to New Mexico State Route 333 just prior to exit 196 on I-40. Here is a map showing the route. You will see brown "Historic Route 66" signs. This road will continue all the way into Albuquerque and intersect with Central Avenue. After leaving Moriarty the road goes through Edgewood, Sedillo, Cedar Crest, and Tijeras. Entering Albuquerque, Route 333/Historic 66 turns right and intersects Central Avenue. Turn left here. Here is a map showing the intersection. Central Avenue is old Route 66. There are many old establishments along here that were doing business when the old road was alive. Among them is the De Anza Motor Court, which features nostolgic swamp coolers in lieu of air conditioning. If you visit in the summer, stay elsewhere. The Route 66 Diner in on Central Avenue and is a good place for lunch. 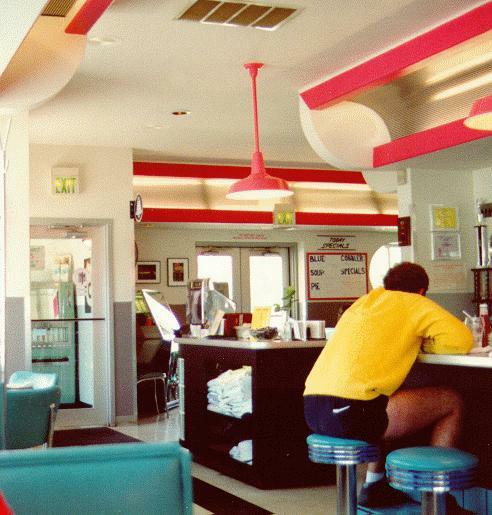 It features a 1950's decor. If you continue west you will reach Old Town Albuquerque. There are also museums in this general vicinity. Old Town is a must see, even if most of what you see is modern tourist traps. 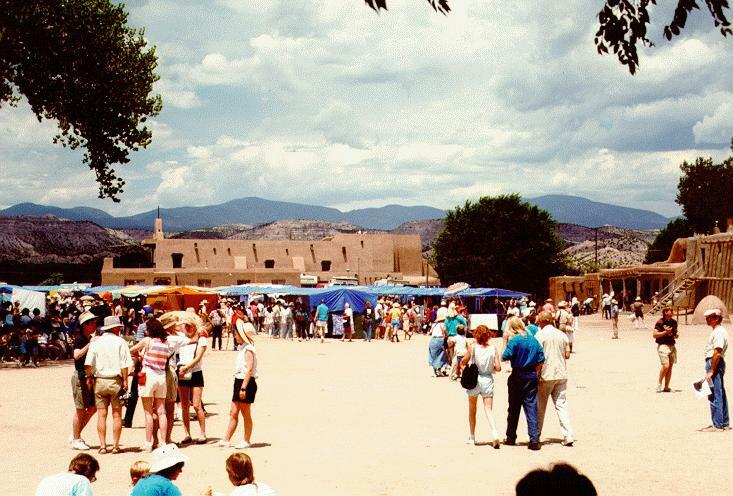 Lots of souvenirs, and an over-abundance of "Santa Fe Style" everything. The coyotes are cute. Getting them home is a problem, but they will ship: anywhere. Take 4th Street south out of town. Follow the blacktop past Isleta, The road paralleles I-25 along this stretch and begins to curve westward at about Los Lunas. This alignment follows the Santa Fe railroad right-of-way. Take Cental Avenue out of town. Cross over the Rio Grande. 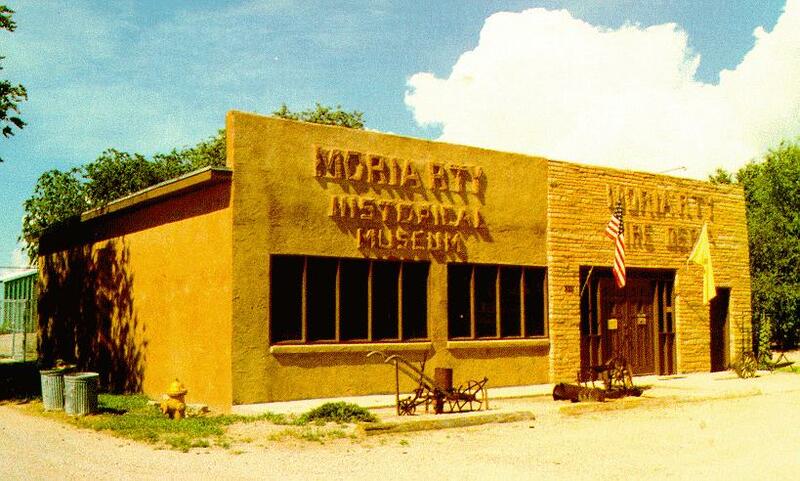 Rejoin I-40 at exit 149 or follow Old Route 66 (Central Avenue NW) to the Rio Puerco Trading Post. 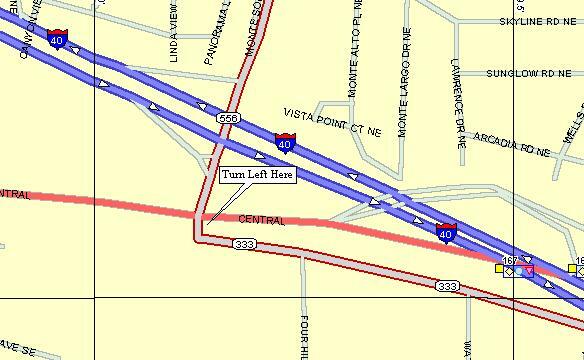 Here you must rejoin I-40 at exit 140 to continue to Laguna. 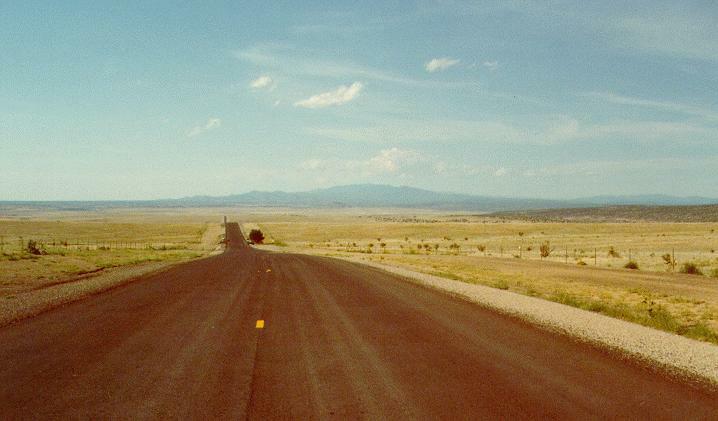 Old Route 66 has been renamed New Mexico State Route 124. 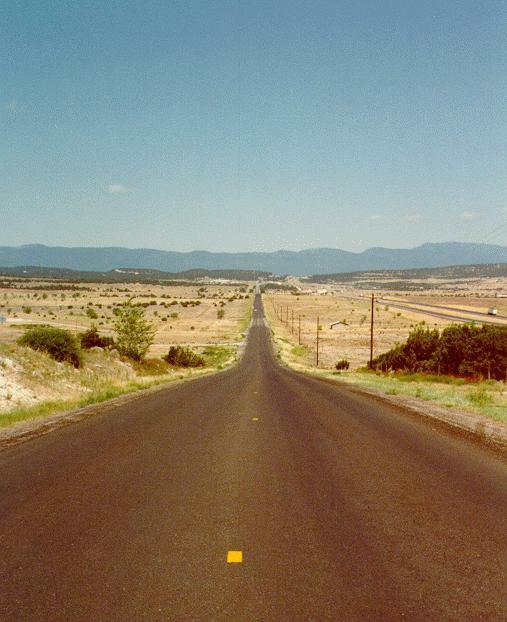 Follow this road all the way to just past I-40 exit 89, where the road becomes New Mexico State Route 117. Follow NM 117 to Grants. Grants got its name from the three Grant brothers, Angus, Lewis, and John. They were contractors for the Santa Fe Railroad in the early days. 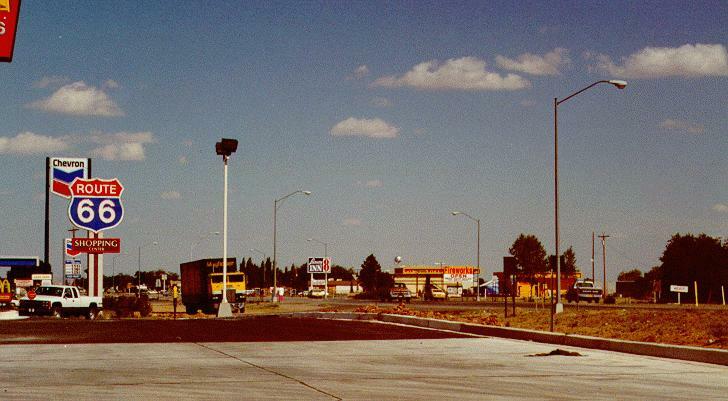 The Grants Motel has closed, but was still standing when I passed through in 1990. NM 117 changes to NM 32 and this is the alignment of Old Route 66. Follow NM 32 through Milan. Just after Milan NM 32 ends at a fork in the road. Take the left fork and follow NM 122. 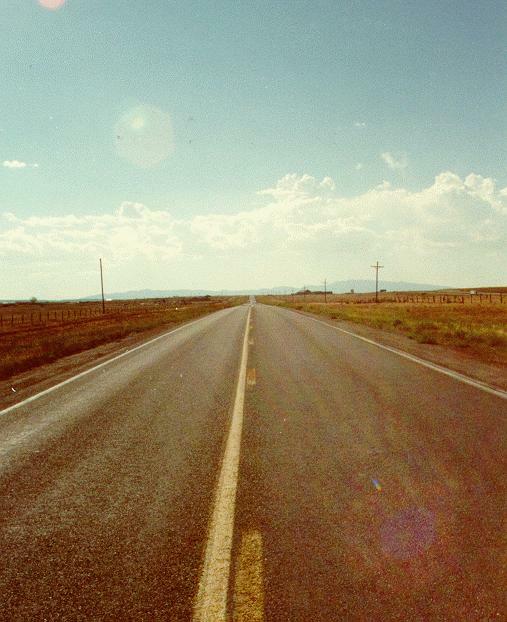 This was Route 66. The road parallels the Santa Fe roadbed and I-40. For most of this stretch I-40 is on your left (west) and the tracks are on your right (east). The road continues through Prewitt and Thoreau before crossing the Continental Divide. 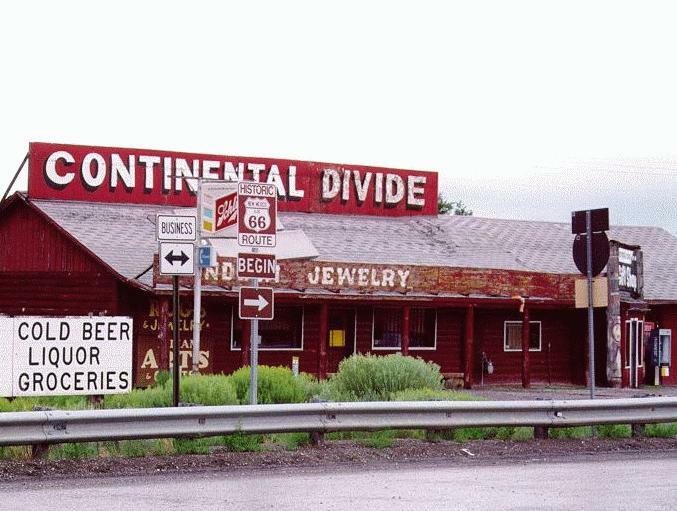 In typical Route 66 fashion, there is a business positioned to take advantage of the Continental Divide. Continue on I-40 to Iyanbito, exit 36. Follow this road into Gallup. It will change to NM 118 at I-40 exit 33. From here it goes all the way through Gallup. 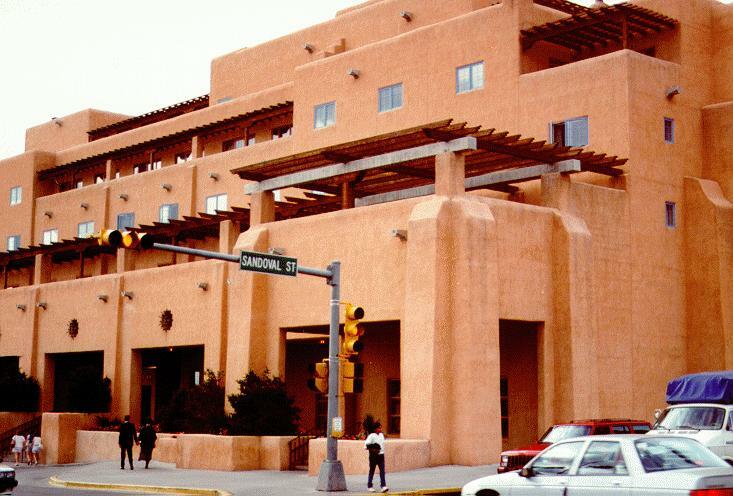 Gallup is named after Santa Fe paymaster David L. Gallup. 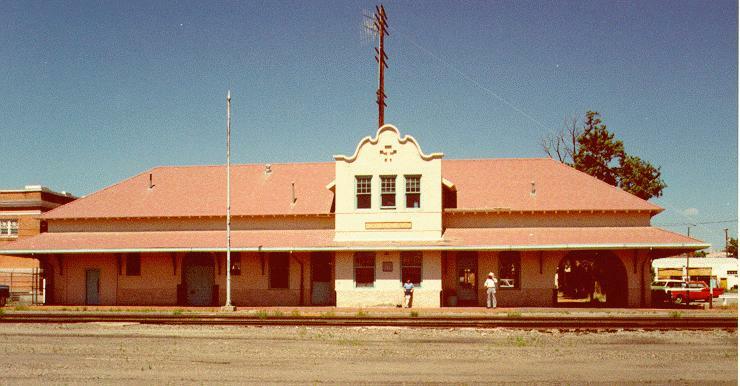 It is another town that owes its existance to the Santa Fe Railroad. There is a large switching yard on the north side of I-40. Route 66 is Main Street (what a shock!) and is actually the seedier part of town. 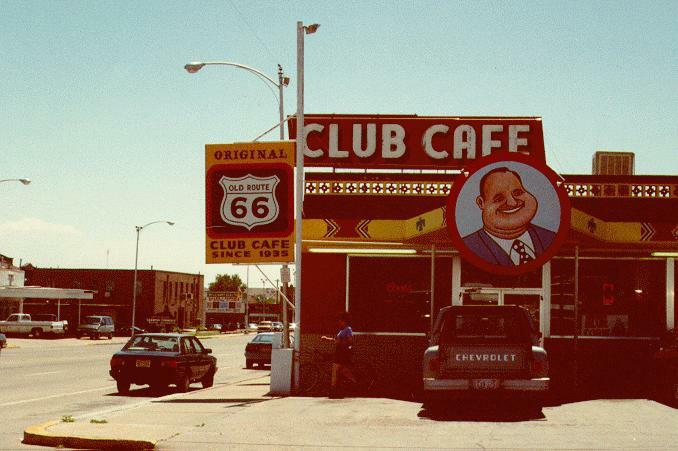 That is true of most towns today along old Route 66: the old highway is usually motel-row, and restaurant-row, and caters to people simply passing through. You can not truly get a sense for a town if all you see of it is that which lies along the old highway. 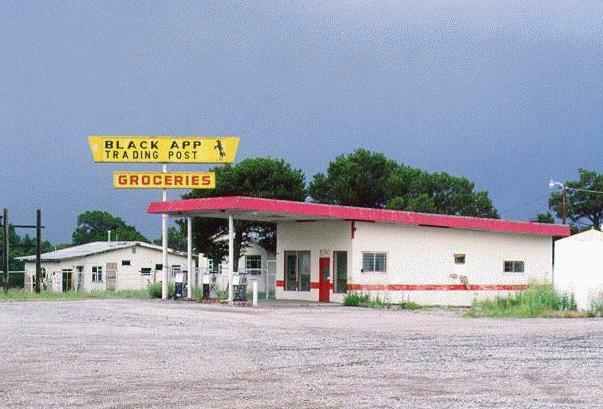 There are a number of structures and businesses that date back to the early days of the old highway. 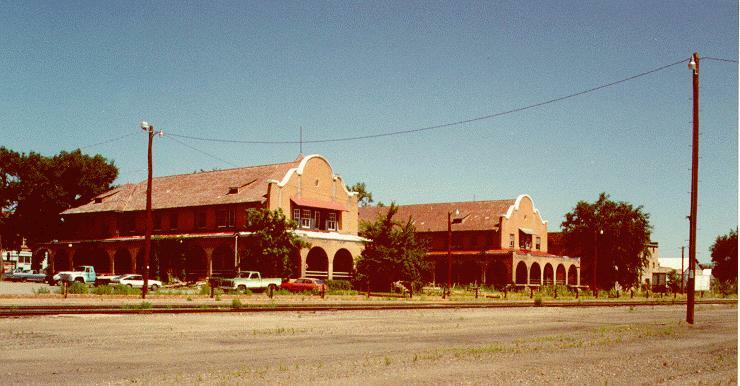 Among them is the El Rancho Hotel (1936). Many famous movie stars stayed here. The Navajo reservation is close by and a larger number of busineses in Gallup sell Navajo rugs, pottery, and jewelry. Window Rock, the tribal capital, is 25 miles north. The Zuni Pueblo is 41 miles south. The Zunis manufacture some very nice jewelry. Follow NM 118 west. It will pass under I-40. Continue until NM 118 enters Lupton. At this point NM 188 ends at I-40. Rejoin the interstate and pass into Arizona.